The Happiest Place on Earth + engagement portraits with a fabulous couple = The Happiest Photo Shoot on Earth! 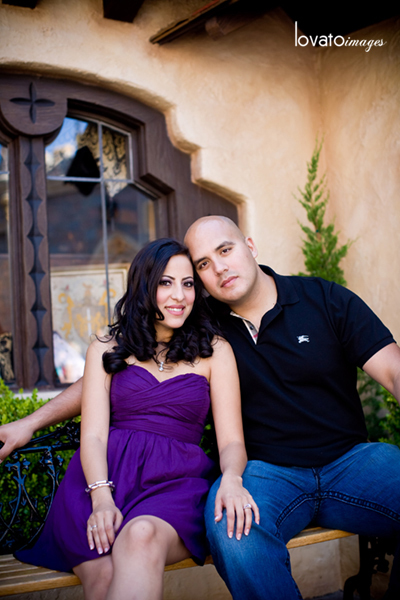 I was stoked when Mary and Miguel wanted to do their engagement session at Disneyland. As annual pass holders, they spend a lot of time there and as many of us do, love the place. So naturally, the three of us were excited to walk around to their favorite spots and document their love. Mary looked like a doll all done up with these rad sling back peep toe platforms and the cutest little purple dress I’ve ever seen. If she had a tiara on her head, all the little girls would have stood in line for her autograph. I know I would have. And Miguel was totally her knight in shining awesomeness. Tall and strong, he held her and looked at her like he’d go to the ends of the earth to protect her and love her forever. It was adorbs. So I totally want an annual pass now. And a little purple dress. And a knight in shining awesomeness. Anyone wanna send those things my way? Lovely shots. Did you have have any issues with the park? I remember them having lens length limits.